The Dallas Mavericks were launching a campaign to celebrate 13-time NBA All-Star Dirk Nowitzki reaching 30,000 career points – becoming only the 6th player ever to reach this career milestone. Their goal was to actively engage their fan base with the hashtag #DIRK30K and generate ticket sales for their upcoming games. To create a buzzworthy email campaign, they used Movable Ink to include a live points status that updated after each game. Movable Ink also enabled them to include a live social feed that made it easy for fans to share their excitement. The result was an email that not only got everyone talking, the Mavericks saw spikes in overall engagement in relation to open rates, click-through rates, and subscriber interaction. 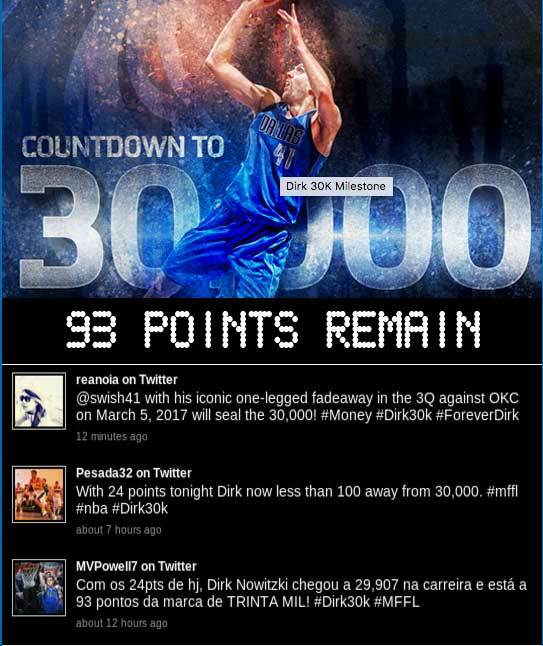 We were able to elevate our #DIRK30K campaign by building excitement with our fan base using fun, interactive elements that were successful at engaging fans and generating revenue.